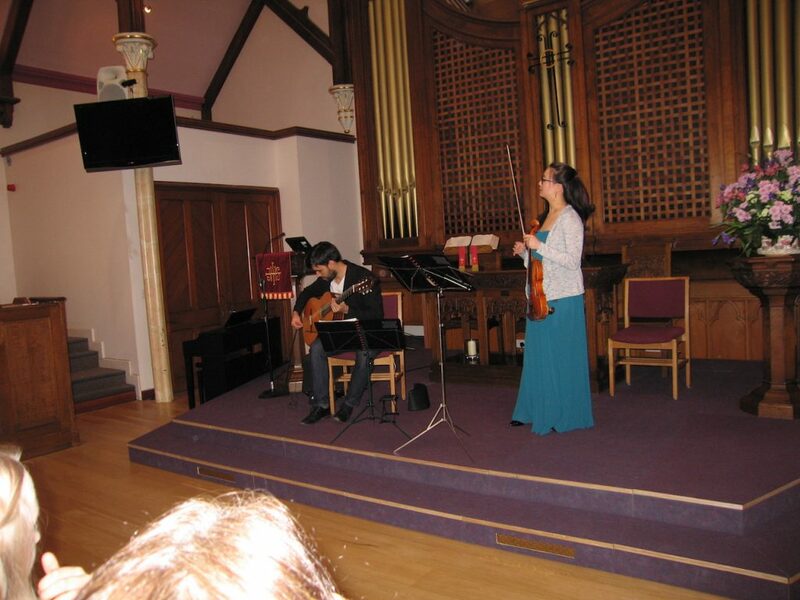 On Sunday afternoon, a well-attended Acorn Centre hosted Duo Escocia – Roberto Kuhn Versluys (guitar) and Katrina Lee (violin). The couple, who met at the Glasgow Conservatoire, are married and made their first tour in Chile, Roberto’s homeland, in May, 2017. Katrina hails from Yorkshire. In an eclectic mix of styles we were taken on a journey from the gentile salons of Europe to the folk music of the wild plains of Romania and to the jazz age dance halls of Argentina. The son of a Genoese labourer, Nicolo Paganini, was a virtuoso violinist, guitarist and composer- one might say a 19th Century rockstar. Intemperate and outspoken, he led a dissolute life, womanising and gambling and his mastery of the violin led to rumours that he had sold his soul to the devil for it. The fact that he died unshriven and was refused a grave by the church fuelled this notion. What is more, he loved playing tricks with his audiences like deliberately breaking strings while continuing to play or mimicking animal noises. There were no devilish tricks about the Duo’s performance of Paginini’s Centone di Sonata. The rather sinister triplet knocks on the door at the opening quickly gave way to jaunty dance tunes that were vigorously supported by the guitar. The lingering ballad-like Allegro Maestoso was played gracefully with sensitiveness but not sentimentality. In his Sonata Concertate that followed the interval there was delightful imitation between violin and guitar. With classical precision, they communicated exactly to form one line of invention. The Tarantella-like finale brought the piece to a thrilling conclusion. J.S. Bach often re-used his work for he was often under pressure to meet deadlines, particularly for his church music. Part of the joy (and frustration) is tracking down the original or reworking of it. In the G major Sonata BWV 1021 for example, might be found the genesis of a vocal work, such as a vocal solo in the St Matthew Passion. The performance was a model of precision and artistry. In the opening Adagio, phrases, particularly scales, were not only articulated but caressed. A brief Vivace led us into an emotional lament followed by a speedy fugue. Roberto showed his skill in arranging the keyboard and cello part for guitar. Bela Bartok was notable as a folksong collector and this was achieved by using portable Edison equipment and wax cylinders. This is not really the stylised “gypsy music” that is dished out to tourists and goulash lovers. What is not recorded is the reaction he might have had from herdsmen who were asked to sing into his machine. The sounds produced in the Romanian Dances are at times strange, eerie and almost hypnotic. 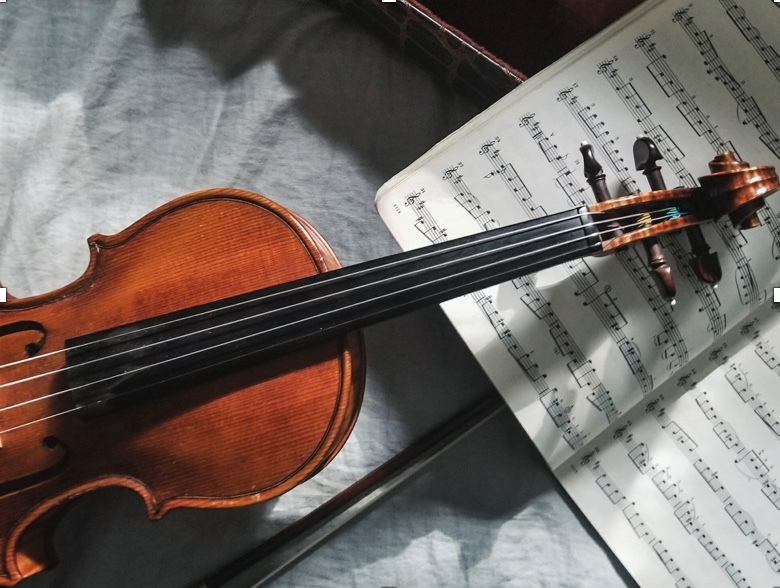 The bowing of the violin near the bridge produced a primitive, wooden tone while the use of harmonics on the upper strings whistled us into the spiritual world. After a memorable tribute to Peter Maxwell Davies with ‘Farewell to Stromness’, the duo also played a lovingly arranged “Wild mountain Thyme”. Katrina showed her skill in reducing softness to the faintest whisper. The musical understanding between the pair was outstanding. Finally Escocia Duo played an Argentinian set of tangos by Piazolla and Villoldo, which showed their mastery of the sways of tempo and contrasts of this captivating dance style, whether it be a tremble or an embrace. They were warmly appreciated by the audience, who will look forward to a return visit from these accomplished performers.